Have you ever made your own birthday cake? I think it is perfectly acceptable to bake yourself a cake, especially if you enjoy baking or are craving something specific. This year, all I wanted was a carrot cake with maple cream frosting. Once I got that combination stuck in my head, there was no going back. 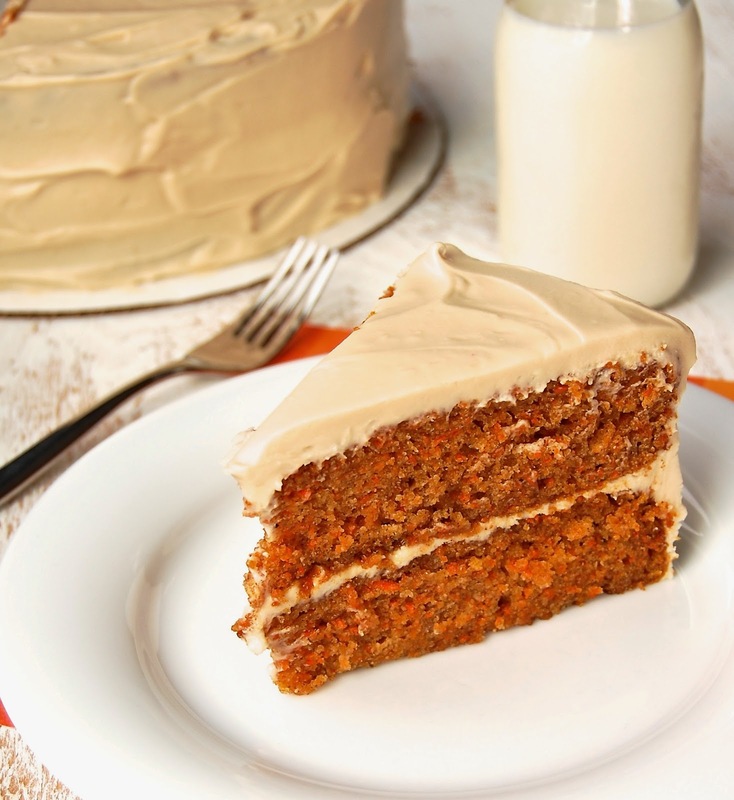 Moist, lightly spiced carrot cake with a thick layer of rich, maple cream cheese frosting...birthday cake perfection. I made it gluten-free and my dad still ate a slice. At first I thought he was just being nice, since it was my birthday and all, but then he also had a slice for breakfast and dessert the next day. I'd say this cake was a winner, and I couldn't have had a better birthday! To prepare the cake, preheat the oven to 350°. Lightly grease two 9 inch round baking pans with butter and line the bottom with parchment paper. Lightly dust the sides with flour. In a large bowl, whisk the oil, sugar, eggs, yogurt, and vanilla together until smooth. In a separate bowl, whisk the flour, cinnamon, ginger, cloves, salt, and baking soda together. Stir into the wet ingredients until well blended. Mix in the carrots. Let the cakes cool for 5-10 minutes in the pan before transferring to a wire rack to cool completely. To prepare the frosting, using an electric mixer fitted with a paddle attachment, beat the chilled cream cheese and butter together on medium speed until light and fluffy. Beat in the powdered sugar, starting on low speed and increasing to medium speed, until a smooth frosting forms. Beat in the vanilla and maple extracts. Fill and frost the cake with the maple cream cheese frosting. Refrigerate until ready to serve. Wow, I definitely will try your recipe. My husband is Celiac and he adores Carrot Cake. Thank you for sharing your recipe. Believe me, I'm honoured to be the first comment on this delicious recipe! I was hesitant at first when making this cake as it is gluten free and sometimes you just never know what you will end up with.... but everyone I have served this to is completely shocked when they find out it doesn't contain gluten ... and believe me, there wasn't a slice left! Made this for Easter and everyone raved about this cake..... so much so, I've been asked to make it for Mother's Day, my cousins birthday, and now my dads. Not to mention, Grandma is always asking me to "Make that delicious carrot cake!" Believe me, you won't be disappointed !! Wonderful, easy to follow recipe! Can't wait to eat this again!